Delvis Heath Sr. is the hereditary Chief of the Warm Springs Tribe. He has been Chief for almost a quarter of a Century. When his father, Chief Nathan Heath, died in 1969, Delvis felt he was not ready to assume the Chieftainship, so he declined. The Sahaptin people gathered and decided that Amos Simtustus, Sr. would become Chief, but, they stipulated that when Amos passed away, the son of Nathan Heath would take back the Chieftainship. Delvis became the Warm Springs Chief and took his place on Tribal Council on May 4, 1984. Delvis was born on the family ranch near Simnasho on September 26, 1938. He is the son of Nathan Heath and Lilly Heath. As a youngster growing up, Delvis was known as “Bullneck.” Bullneck’s grandfather William McBride raced horses and it was not long before young Delvis was riding his grandfather’s horses in races around the area, just as his mother had done before him. Delvis traveled with his grandfather to places like Bend, Redmond, Prineville, and Tygh Valley in his horse drawn wagon. There were always three racehorses tied to the back of the wagon. The late Martinez Heath, one of Delvis’ younger brothers, became one of the top jockeys in the United States in the 60’s and 70’s. In 1960, Delvis married a young lady from Celilo Village on the Columbia River. More than forty-eight years later, he and Shirley Stahi are still married. They raised four children, of whom two are deceased. They have eight grandchildren and five great grandchildren. They also raised a niece and a nephew as well as numerous other children. For many years, the family ran the Chief Heath horse stables at Kah-Nee-Ta High Desert Resort and Casino. It was a family operation and wife Shirley, who is retired from the school district, ran the business until last year when the family decided it was time to hang up the spurs and saddles. For many years the Heaths also raised and raced thoroughbreds and quarter horses. They still run several head of cattle on the Reservation range. 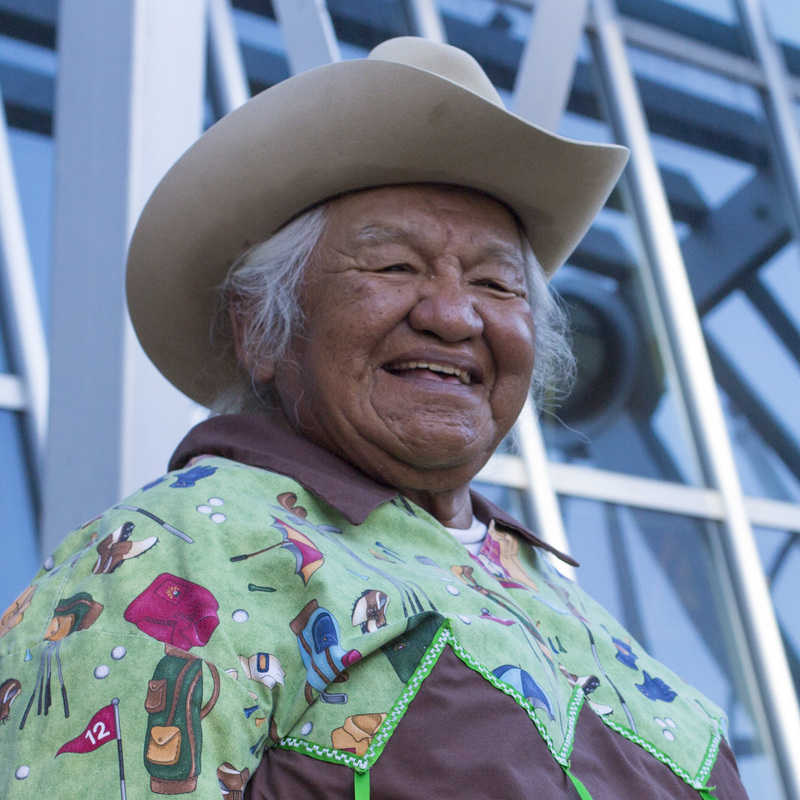 Chief Heath is considered the Confederated Tribes foremost goodwill ambassador. He is a leading figure at ceremonial functions, and is an important liaison for the Tribe in dealing with Treaty issues with both federal and state governments. He has been very active in the in-lieu fishing settlements. He speaks the language of his ancestors, and is often called on to open or close a tribal meeting or event in prayer. As the chief of the Sahaptin speaking people, he follows the teachings of the Washat religion. He is active in the Longhouse, participating in spiritual dancing, drumming and singing. The Chief lives by traditional values taught to him as a child. He articulates the virtues of being honest, of working hard, of getting an education, of taking care of the elders, and not abusing alcohol and drugs. Delvis still rides for horses and cattle, participates in the annual family cattle roundup and finds a way to spend time on the golf course or at the bowling alley. He still rides in parades, will climb on a wild cow at the Huckleberry Feast kid’s rodeo or take on all comers in the wild and woolly Pi-Ume-Sha Treaty Days Endurance Horse Race. Delvis Heath Sr. is the hereditary Chief of the Warm Springs Tribe.